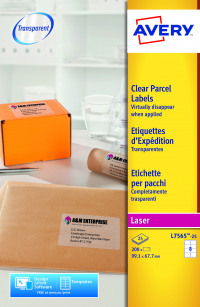 • Transparent labels give a highly distinctive and professional impression to all your mailings. • Now easier to peel and faster to apply with the unique QuickPEEL feature. • Divide the label sheet along the perforation to expose label edges and easily lift the label from the sheet - or simply keep the sheet intact and peel the labels as before. 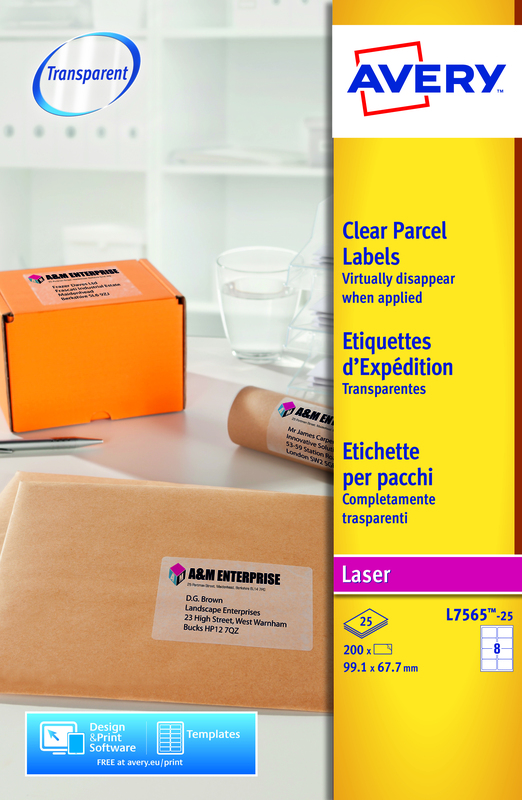 These Avery clear laser labels are virtually invisible when applied for professional packages, parcels and envelopes. For use with laser printers, the labels feature a QuickPEEL feature for easy application. Made from durable polyester, each label measures 99.1 x 67.7mm. This pack contains 25 A4 sheets, with 8 labels per sheet (200 labels in total).